This strawberry salad is different and a great option to add to any meal. This weekend I had my Christmas dinner and gift exchange with my closest friends. I volunteered to make a salad and wanted to try something new. Knowing that some of the girls are very picky when it comes to vegetables, I knew this was going to be a challenge. Here’s what I put together for a salad. 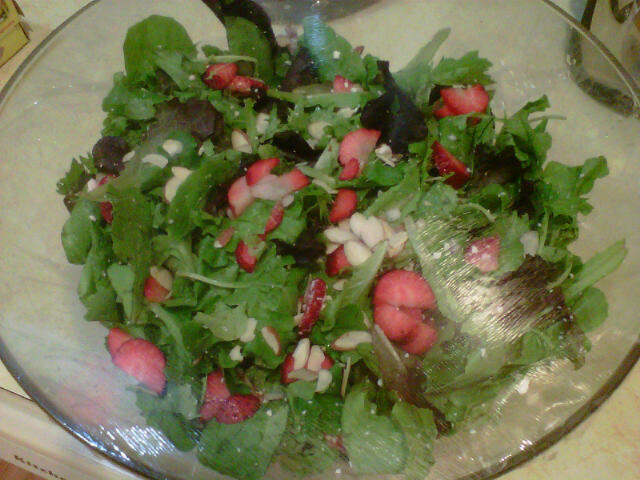 A mix of leafy greens, sliced fresh strawberries. Some thinly sliced almonds, sliced black olives and a handfull of chopped red onions. Lots of reduced fat feta cheese gave it a nice touch. I bought two dressings: classic balsamic vinagrette and sugar free rasberry vinagrette. It was a great side to the delicious pasta we were having!